If you are looking for a three piece candle holder then the best option for is this tri wheels candle holder. It is a made of metal and provides an antique art piece view due to its golden color. The custom of lighting a flame has first started from the ancient Egyptians. They are not only the source which helps in getting rid of the darkness at night but also used as a medium to interface with the Lord. Well now the candles are available in various sizes, colors or designs but the mysticism related to them remains the same. Hence that’s the main reason that most of us are complimenting the beauty of a candle through the candle holder which helps in bringing peace to your mind or body. Candles are always the decisive source of energy and power. If you pair it with this magnificent tri-wheel holder than you may experience the extraordinary view as well as feeling of emotions at your place. Offer it as a gift to your dear ones, as it works as a source of motivation for them too. 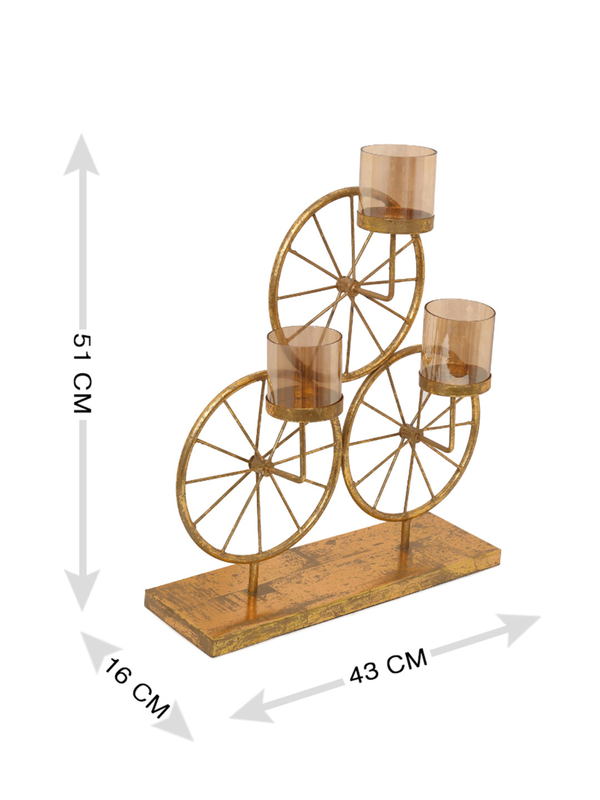 Bring back the positivity to your place with the natural source of power, Tri Wheels Candle Holder, gold @home.